This is a continuation of the brand’s efforts to improve the F-Series for 2013, by raising the bar for towing, hauling and braking to again raise the standards for heavy-duty trucks. "Super Duty pickups and chassis cabs are the segment benchmarks, chosen by tradesmen more than any other heavy-duty truck to get the job done," said Raj Nair, Ford group vice president, Global Product Development. "To help our customers continue to become more productive and efficient, we've increased our towing and payload capability yet again." Ford F-Series Super Duty trucks are built to suit the needs of the hardest working customers. With that in mind, engineers for the brand have boosted the conventional towing capacity of 9 tons by 500 pounds over the nearest competitor to18,500 pounds. The payload capacity has been boosted over 3.5 tons to 7,260 pounds to compliment the increased class-leading towing ability. Of course higher payload and towing power requires an improved brake system to safely increase capability and usability. Ford’s braking engineers have utilized larger brake rotors by 16.4 percent in front and 14.5 percent in the rear for maximum braking and heat dissipation, highly necessary to working down on long roadway descents. The greatly enhanced braking has allowed a 700-pound increase in the maximum Gross Vehicle Weight Rating to a best-in-class 14,000 pounds. Furthermore, the brake pads and a retuned booster deliver an enhanced feel to the brake pedal, that translates into greater driver security and confidence. "We've really improved brake feel," said Michael Watkins, brake system engineer. "There's refined modulation in the pedal – you really feel the stopping power. With a full load of cargo, drivers will notice strong, confidence-inspiring brakes." A corresponding enlarged parking brake on the F-250 and F-350 models has also allowed an increased maximum payload rating for those models. The availability of adjustable pedals allows owners to customize the pedal response to enhance the bond between driver and truck. All-new Super Duty Platinum trim level. For 2013, Ford will introduce the all-new Platinum series model and along with SYNC with MyFord Touch telematics. The Platinum series makes a bold grille statement with satin chrome surrounding a perforated mesh and additional exterior upgrades. The interior adds the luxury of premium wood accents, a heated, leather-wrapped steering wheel and other premium aspects. 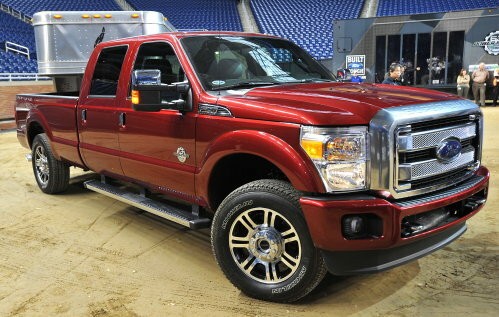 The 2013 F-Series Super Duty adds the SYNC with MyFord Touch, available for the first time in the truck lineup. A new 8-inch, high-resolution touch screen display enhances phone access, climate control, entertainment and navigation features, and includes a dramatically improved voice control command set. A rearview camera behind the truck that’s activated when in reverse and displayed on the 8-inch screen aids in tight maneuvers or hooking up a conventional trailers. Showing remarkable foresight, the interface for MyFord Touch has a modified touchscreen interface to allow those wearing work gloves to access controls without removing their gloves. The Ford F-Series has been the best-selling truck in the U.S. for 35 straight years. With a long record of the best in class towing and payload capability and known for Built Ford Tough durability have contributed to and helped build fervent F-Series customer loyalty. The 6.7-liter Power Stroke diesel and 6.2-liter V8 gasoline engines – with class-leading fuel economy – will reward new Ford owners for their continued loyalty for years to come.